One of the most recent source unit introductions from Sony Car Audio is the XAV-AX210SXM DVD receiver. This multimedia receiver features a 6.4-inch touchscreen with Apple CarPlay and Android Auto smartphone integration. It’s the first Sony product to include iDatalink Maestro compatibility. 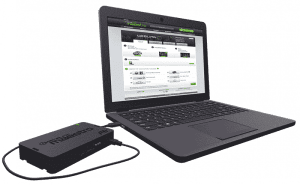 Let’s look at the features of this high-value source unit and explain how Maestro vehicle integration dramatically expands the compatibility options for this receiver. 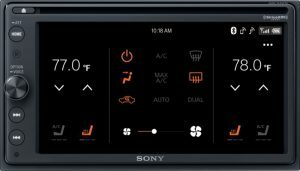 By adding the optional iDatalink Maestro RR or RR2 interface, your installer can integrate factory-installed features like a backup camera, parking sensors, USB ports and infotainment systems like Ford Sync with your new Sony radio. 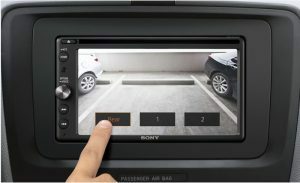 The three camera inputs can be used with factory systems like Honda LaneWatch or can be triggered by the turn signals to show cameras added to the side mirrors of the car. 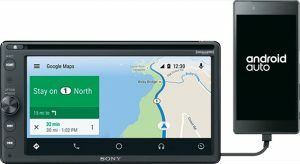 Sony and Maestro also include the option to automatically display a forward-facing camera when traveling at speeds under 5 mph. Another unique feature that’s exclusive to Sony is the ability to feed volume control commands back into a factory amplifier. Say you have a Toyota with the factory JBL amp. You can configure the AX210SXM and the Maestro RR to use the volume control built into the factory amplifier while the source unit provides a clean, clear signal. The result is amazing sound quality without distortion or clipping. This unique feature also gives it the ability to integrate with all MyFord Touch (or MyLincoln Touch on Lincoln vehicles) features. Check with your local authorized Sony retailer to find out which vehicle features are compatible with Maestro and the new XAV-AX210SXM. The XAV-AX210SXM includes Android Auto and CarPlay smartphone integration technologies to let you make phone calls, listen to text messages and dictate responses safely and efficiently while driving. These systems also include support for myriad entertainment options like Pandora, iHeartRadio, Google Play Music, Apple Music and Tidal, as well as many options for podcasts and audiobooks. Getting where you want to go is safe and easy, thanks to Google Maps and Waze integration. Simply ask for directions to the destination you want, and these systems will create a safe and efficient route, then provide turn-by-turn directions. Real-time traffic information is used to ensure that your trip is as efficient as possible. Google Maps and Waze are now available on Apple iPhones as well, so users can enjoy the simple navigation interface regardless of the type of phone they prefer. 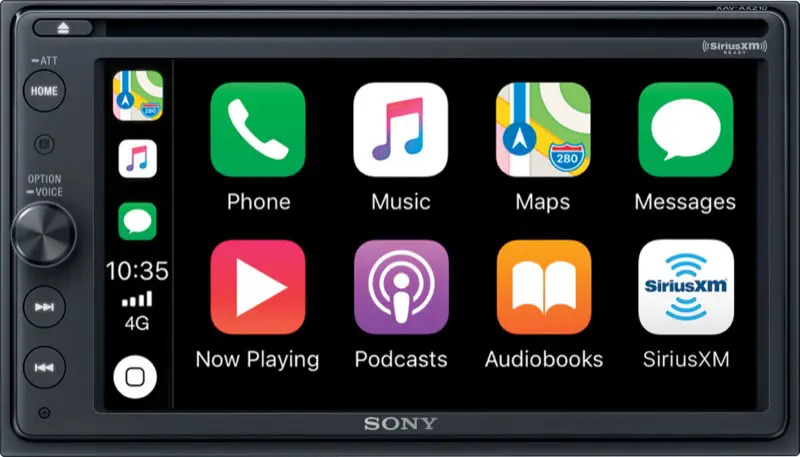 For added convenience, Sony has programmed the radio to automatically launch CarPlay or Android Auto as soon as you connect your phone to the USB port. The Sony XAV-AX210SXM includes an AM/FM receiver, will play CDs or DVDs and has a rear USB port for digital media playback or smartphone connectivity. Digital audio file playback includes MP3, WMA, AAC, FLAC and WAV formats, and the system will play Xvid, MPEG-4. WMV, FLV and MKV video files at resolutions up to 720×576 pixels (depending on the format). Bluetooth audio streaming is also included. An SXV300V1 SiriusXM Satellite Radio receiver comes with the radio, and Sony has worked with SiriusXM to provide a free 90-day trial of the service to get you going right away. The XAV-AX210SXM features an easy-to-use and intuitive rotary volume control that doubles as a quick-access button to equalization functions. A built-in 20 watts-per-channel amplifier will drive your factory-installed speakers, or you can upgrade your vehicle with an external amp using the 4.0 volt-capable front, rear and subwoofer preamp outputs. Built-in high- and low-pass crossovers further enhance the system design and tuning options that are available. 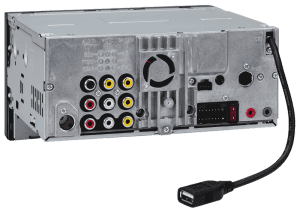 The rear chassis of the AX210SXM is not as tall as a full-size 2-DIN receiver to make it easier for your technician to mount the system in your dash. As mentioned, this radio includes three camera inputs, with the rear input automatically triggered when you put the transmission into reverse. Icons on the screen allow you to select the other two inputs to access blind spot or forward-facing cameras, and your installer can set any of the inputs to display a normal or reversed image to make the system work with almost every camera on the market. Provisions for standard steering wheel audio control interfaces are provided for applications where Maestro won’t be used. If you are in the market for a new multimedia receiver for your car, truck or SUV, visit your local authorized Sony retailer and ask for a demonstration of the amazing new XAV-AX210SXM receiver. They can provide you with all the information required to integrate this amazing radio into your vehicle and program an iDatalink Maestro interface to provide the vehicle-specific functionality you want.